A versatile boost to help shape your sound to perfection. The Lehle Julian is an advanced Lehle Sunday Driver SW and offers additional controls like the parametric mids and treble. It has developed into a versatile booster - especially with the vintage users in mind - to adjust the input of a tube amp. The parametric midboost allows individual sound shaping as well as recreating the characteristics of familiar classics like the established Dallas Rangemaster or the Hornby Skewes Treble Booster, supplying the ear with familiar sounds. Since these boosters had a very low input impedance we have equipped the Lehle Julian with a switch that reduces the impedance from 1 MOhm to 10 kOhm for authentic rendition of their characteristics. The treble control completes the sonic performance. And the best: all settings from "muffled" to "edgy" are always audio friendly, there is no dull or piercing sound. The overdrive grade of the connected amp can be fine-tuned with the gain pot by +/- 15 dB ranging from super clean to distorted. The Lehle Julian always delivers a clean output thanks to its JFET input stage. Its personal dynamic derives from the fact that the incoming current is rectified, stabilized and doubled to 18V right after the powersocket. In OFF status, the Lehle Julian provides two different modes of operation - in TB (= True Bypass) mode, the input and output are linked with zero losses to one another via a switch with gold-plated contacts. True Bypass mode is the best option for a small set-up with short cable routings and when a classical fuzz pedal is looped in after the Lehle Julian. The line-driver function, located at the start of the train or in an effect chain, is the better solution for long cables and for complex effect board configurations. Running the Lehle Julian in TS mode (= True Sound) it becomes active as a buffer, but without amplifying or coloring the signal. 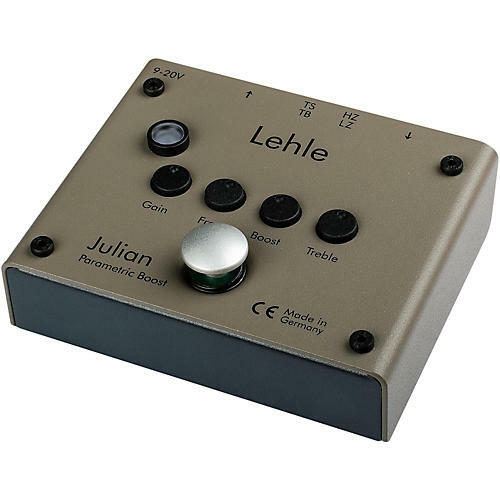 The Bypass mode option enables the Lehle Julian to integrate ideally into any set-up, whether as a battery-operated stand-alone unit, or in an existing pedal board.